We spend 60% of our time at work but many of us pay very little attention to what we eat and drink during working hours. One third of us don’t have time to have breakfast which is the most important meal of the day. Many struggle with fatigue and low energy levels not realising that the way we feel has a direct correlation to what we eat during the day. From our experience of working with different organisations people don’t have time to think about food and make healthy food choices at work. They are too busy and too stressed. We would like to change this. Food can be our fuel if we do it right. 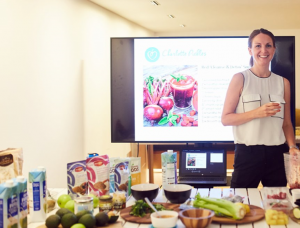 Choose from:60 minute seminar-style nutrition workshops led by an accredited nutritionist. Smoothie making workshop—learn about how to make smoothies.